THERE ARE coming of age stories where you want to cry and hug the narrator because you identify so, and there are coming of age stories where you want to cry and kick the narrator because you identify so. Udaan has plenty of crying, hugging and kicking, but it all remains lucklessly on screen. The first Indian movie in seven years to be selected at Cannes is a choker. Vikramaditya Motwane’s debut feature, produced by Anurag Kashyap and UTV, is about a teenager suffocating under his petty tyrant father in the small town of Jamshedpur. The film opens with a superb first act in a Shimla boarding school, where our young hero Rohan (Rajat Barmecha) and his friends get caught in the administration’s hypocricy about Ms Kanti Shah and her angoor. The kids are expelled and Rohan returns to Jamshedpur, where he begins to live with a father he hasn’t seen in eight years and a six-year-old stepbrother he didn’t know existed. Here in Jamshedpur, Udaan lands in sand. Motwane keeps the same flat tone after this point — whether with Rohan drunkenly joyriding in his father’s car or attending college or working in a factory. Everyone is played straight: Rohan is the insipid poet-dreamer, the brother is the innocent kid, the uncle is the irrepressibly guffawing wingman, and the dad is the perfect discipline freak — child beater, frequent drunk, happy philistine and infuriatingly assured behind his dark Ray- Bans. The hospital attendants, the factory crew, the college seniors — everyone is a happy camper. Jamshedpur could well be the country’s sweetest honeymooning destination. What’s the point of making a small budget film if you’re going to use hackneyed themes? Motwane bases all of Rohan’s possible piquancy on his ambition to be a writer — he scribbles dreamily in high grass and recites poems to the elders. The film slumps in autopilot clichés, such as how the kids drink and brawl or how the crabby old hospital patient is actually the sweetest man on earth. 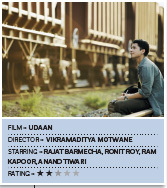 Udaan restrains a melodramatic story in all the wrong ways. Is this all that Kashyap’s crack team can dish up? I kept expecting a solution in the small town, but lo, Rohan ends by bathetically accusing his father of never having felt love and fulfills the film’s title. I didn’t want to run away with him, I wanted to stay in Jamshedpur and see it properly, and even see how the dad’s third marriage goes. Especially as Amit Trivedi’s stone-crashing music tries to lift a dull close-up of the pasty Rohan smiling pastily on.